Unfortunately Fatwallet has closed it's doors as of 10/16/2017. A Fantastic Replacement has arrived to take it's place - Read all about it here ! Ever heard of Fat Wallet ? It's time to get on the train if you haven't. As a blogger, making money may not matter right now to you especially if you're just starting out but as time goes on, earning a little change from your efforts just makes sense and if you're giving the people what they want, chances are good that they won't mind doing a little shopping through your website portal to support your hard work. When you ooze generosity, your kindness gets noticed and is in turn rewarded with generosity.. While some may be inclined to disagree based on individual experiences, there's always the exception, but from where I stand, I can't think of a better way to be. While Fat Wallet is a platform for consumers, you may think that it doesn't necessarily apply to you as a blogger. You couldn't be any farther from the truth I assure you. As a blogger, buyer consumption is a great thing. If you haven't realized it yet, if a place has a ton of buyer consumption that's the kind of real estate you want to be associated with. They work with a pretty impressive set of retailers. Offer cashback to the consumer (huge incentive which brings people in droves to their website). They boast that they have paid over $50 million dollars to consumers that use their website too. Alexa ranking of 1173 which means they are in the top 1% of all websites online and they are VERY popular which also means they are seeing 100's of thousands of visitors daily and that's being conservative. They have an affiliate program ($5 per referral + BONUSES !) Keep reading.. we'll explore this in more detail later in the post. As a blogger, you always have to keep your audience at the forefront of what you do. If there's one thing that I keep at the core of my beliefs when it comes to blogging online, it's about what will provide the most benefit to the people that read what I write about. Without an audience I'm basically dead in the water so the ability to develop and nurture my audience is critically important to the health and growth of my website. So much of that is done through sharing. The more you share, the more you get shared and that's how we build a community worth building. Fatwallet provides a huge benefit to consumers in rewarding them for what they do everyday anyway. As a blogger, you can benefit from this by simply sharing this with your user base. Fatwallet has been around since 1999 and interestingly enough I just discovered them this year. If the thought comes to mind that tons of people already know about Fatwallet, you'd be right and wrong. Tons of people do already know, but there are tons of people that don't as well. The cashback incentive to consumers is a really big deal. Sharing information about Fatwallet means that you are doing something "GOOD" for the people that read what you write about and clearly that's what you want. Your readers must be provided with benefits, information that is helpful to them, because at the end of the day irregardless of how cliche this is.. the big question for anyone that peruses your website or follows you wants to know "what's in it for me". I've seen offers providing more than 20% cashback on purchases which is almost unheard of ! That's the kind of information your readers want to know about regardless of what you blog about because we are "all" consumers. Here are a few items that you can share with your readership about what's inside.. here's a few items of interest on the top panel. Fatwallet provides the consumer with stores, beyond stores, beyond stores to choose from whereby they can shop and earn cash back on purchases that are made. The likeliness of someone to shop with the understanding that they will earn money back on their purchase is high. The big question is does it really work ? Having made purchases myself through Fatwallet, I can tell you first hand that it truly does. The coupons section is advantageous to consumers as well. In this section, there are additional deals and coupon codes that can be applied to specific products when clicking through from Fatwallet's website. 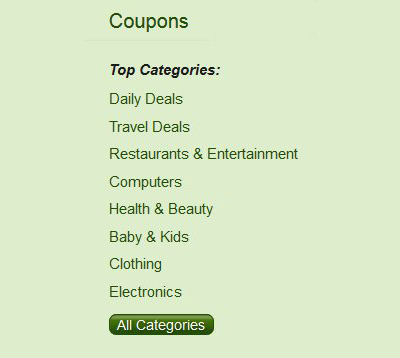 This section is more or less an extension of the coupons section. More deals but it's different from what the consumer would find in the coupons section. With that said, Fatwallet provides bloggers the opportunity to benefit from sharing their website with consumers. Consumers defined as being friends, relatives, associates etc. Their website rewards you through a referral program. This referral is through an affiliate link that is provided to you after signing up (it's a free signup... pretty painless and fast which is nice) and becoming a member when you seek out additional information through their noticeable "$20 for inviting 2 friends small banner" that is on their navigation pane on their website. Quite honestly, Fatwallet could have stopped there with "x" amount of dollars for each referral, but the true uniqueness in their referral program is that after inviting 2 people a bonus of $10 is applied. Getting to the $20 seems pretty simple, but the next bonus doesn't get applied until you get to 20 referrals. Now keep in mind you're earning with each referral, but when you reach certain "milestones" they reward you back which is unique, cool, awesome.. or whatever other word you'd like to use to describe this.. Typically with many referral programs you may see something minimal applied as a bonus when that's applicable, but the bonuses get pretty substantial as your referrals increase with Fatwallet. At 20 referrals, there's $150 bonus applied. At 50 referrals there's a $350 bonus applied and at 100 referrals there's a $1000 bonus applied. If you know of another referral program where bonuses like that are paid out, by all means please share because I haven't seen one and I've certainly explored a decent share of affiliate programs. Affiliate income may not be the central focus for your blog, but when you can generate affiliate income while simultaneously providing a very sensible benefit to your readers, it's a win-win for everyone. Fatwallet does that for you and for your audience. My writeup about Fatwallet is just as much for my readers as it is for me. For the readers that aren't aware of this website, I sincerely encourage you to take a look at it because there is a real benefit to using the website and it's simple even for those that know very "little" about computers. You shop through Fatwallet and earn.. it's that simple. For the blogger, as I've said before, sharing is everything. Sharing good information ultimately means that people will share it with others. If they are sharing what you have to say about Fatwallet, you'll earn.. it's that simple. I share what I feel will benefit my readers and hope that in turn they share it with others too. Fatwallet is a no brainer.. it's too easy and too beneficial for anyone not to use. Additionally, it's something that I have used personally and felt overwhelmingly compelled to share with you.